Meet our representative on arrival at the Bangkok Airport and take a transfer to Pattaya, about 147 kilometers from Bangkok. Spend the rest of the day at leisure or enjoy the Alcazar show (optional). Stay overnight at hotel in Pattaya. 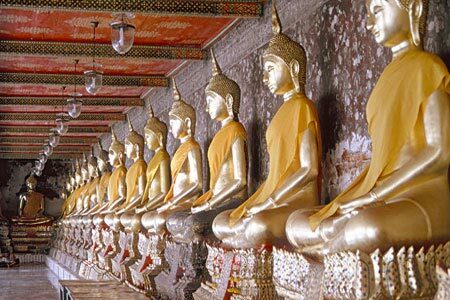 After breakfast at the hotel, enjoy a half day city and temple tour of Bangkok. 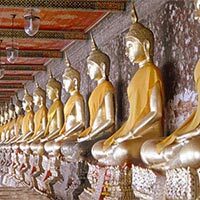 Visit Wat Traimit or the Temple of Solid Gold Buddha, Wat Pho or the Temple of the Reclining Buddha and the Wat Benchamabopit or the Marble Temple and the Royal Palace. Spend the evening doing your own thing in this wonderful city. Stay overnight at hotel in Bangkok. After breakfast, check-out of the hotel and take a transfer to the Bangkok Airport to board the return flight.